Tutorial 2:Searching virus response-related gene groups. This example shows a usage to obtain coexpressed genes for a particular function (viral defense system). Humans have a complicated and well-developed system for various invasions. Identification of the genes in a asystem is the first step for deeper understanding of the system. For gene identification, it is efficient to list and classigy the genes of co-functional candidates, using coexpressed genes. 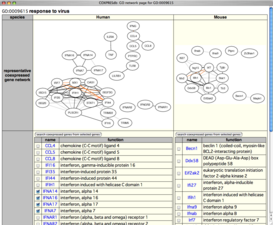 First, search core genes for virus response. 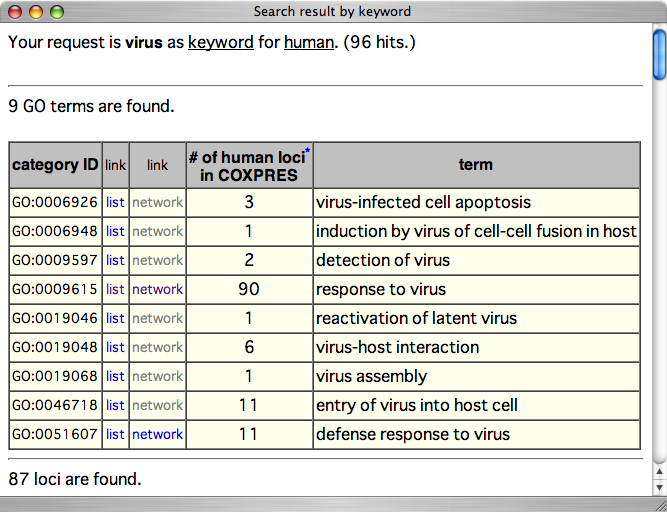 Search "virus" using search form next to the title logo in COXPRESdb. Nine GO terms are found. "response to virus" is the largest and most appropriate term to define core genes of virus response. Click the link for the "network" for "response to virus". 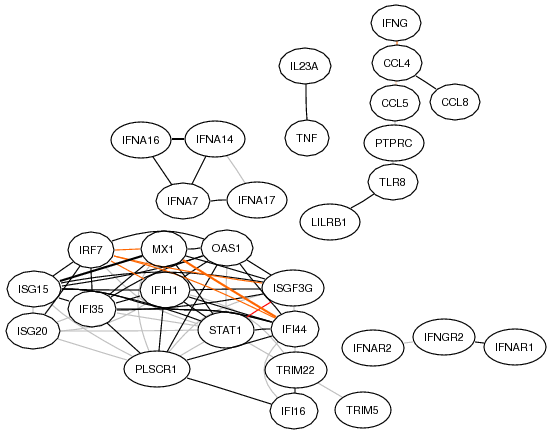 The GO network page provides the 30 most highly coexpressed genes are selected from the corresponding GO gene list, and their networks are drawn in parallel views for human and mouse. The GO network page is composed of 2 parts. 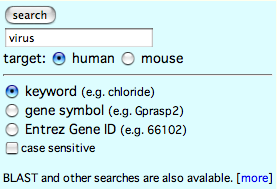 The method selecting coexpressed genes are shown in other page. 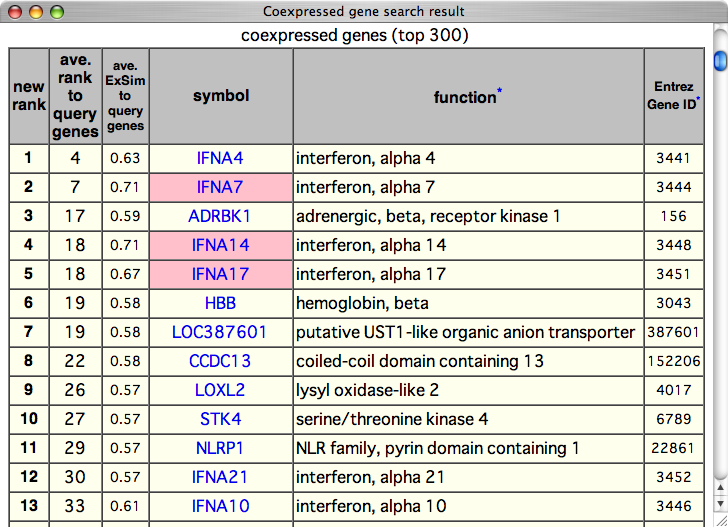 To deduce the biological meaning of each network, the information in the external links on each gene page is useful in addition to the information presented in COXPRESdb. Two networks, corresponding to the networks 1 and 2, are also found in mouse. 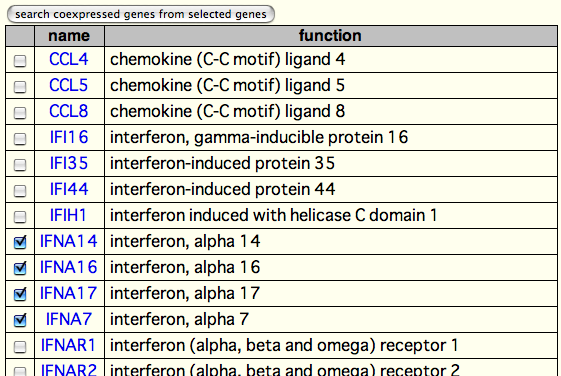 To search other genes that function with these groups of genes, check and submit the genes to search, for example the group of genes for interferon alpha above. Functional putative or unknown genes in addition to many interferon alpha genes are found. In the same way, the user can obtain coexpressed genes for other gene groups. Finally, whole gene lists containing putative virus-responsive genes can be obtained.